Review: Marvel's Agents of SHIELD: "Nothing Personal"
With "Nothing Personal," the twentieth episode of ABC's Marvel's Agents of SHIELD, we're only just beginning to get a sense of what this series is about, really. With two episodes left in the season, it'll probably be next year (if the show is renewed) before we truly understand what the series's status quo is -- on the "non-mythology" episodes, will they still be flying around on the plane, investigating metahuman incidents, or something else? -- but "Nothing Personal" is the first time the cast knows all (or at least most of) the major secrets and are finally on equal footing both with each other and with the viewing audience. SHIELD's showrunners, we find in retrospect, played a dangerous long-game with this show's first season. In "Nothing Personal," when hacker Skye revisits the diner where she met Mike Peterson (now Deathlok) in the first episode and also comes face-to-face with Peterson again, it becomes super-clear the extent to which the seeds for this season-ending storyline were planted right from the beginning. SHIELD has only recently "gotten good," where earlier episodes were somewhat hokey; we understand now that some of that hokey-ness was intentional such to intensify the reveal of team tough-guy Grant Ward as an enemy HYDRA agent. The showrunners risked some viewers might give up before that seventeenth episode reveal -- and in fact, given falling ratings, it would seem many viewers did (episode 19 showed a small up-tick in viewership, but it remains to be seen if this continues). The twist here is reminiscent of one Marvel pulled in their Thunderbolts comic, but that reveal was at the end of the first issue, not seventeen-plus weeks in. My own early difficulty with Agents of SHIELD's largely involved determining what kind of show it actually was. On one side was Avengers et al's Agent Coulson, in charge and cool under pressure, Ward, and pilot and also tough-as-nails Melinda May, all of whom represented what one might expect from a Marvel spy show -- a cast worthy, say, of Mission Impossible film. On the other side were the quirky, smart-but-awfully-bumbling Skye and scientists Fitz and Simmons, who were cutesy not in a cool way (like Black Widow teasing Captain America about finding a date) but in a kind of awkward, that-joke-really-wasn't-funny kind of way. The show most often seemed to buckle when these two sides butted up against one another, as in the rumblings of a romantic plotline between Ward and Skye, which felt forced since, taken logically, Ward likely wouldn't be attracted to Skye, someone with no military or black ops background like himself. I cheered when Ward and May got together, if only because it heralded an end to the Ward/Skye romantic possibilities. In trying to link the two sides like this with Ward and Skye, the show pushed and pulled in too many directions -- it was a pretty good action show and a somewhat trite soap opera, and in trying to be both it didn't quite succeed at either (whereas Arrow, understating the soap opera a little more, finds a better balance between the two). The reveal of Ward as a HYDRA agent effectively ends this fragmentation, in a couple of ways. First, it puts the final kibosh on the Ward/Skye relationship, so that silliness ceases to drag down the show. Second, it tips the scales for the show back toward the quirky characters. Coulson can do quirky; it would make sense for actor BJ Britt to stick around as Agent Antoine Triplett to fill the "specialist" role in the team vacated by Ward, and Britt has a more laid back personage than Brett Dalton's often-imposing Ward, such to allow Triplett also to bridge the gap between the team's action and quirky sides. In taking out Ward, SHIELD is no longer a show about Ward with the other characters as support, but rather becomes more of an ensemble (or, at least, defines itself better with Chloe Bennet's Skye as the lead). 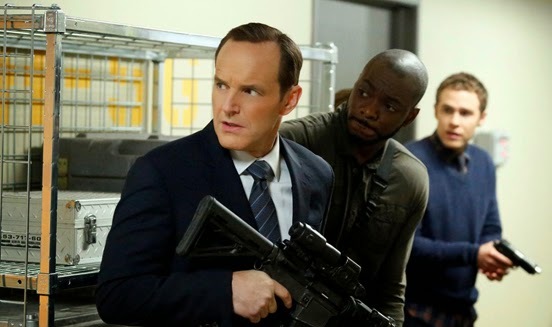 SHIELD emerges as a show about a band of misfit, hard-luck heroes, and the tone of the show achieves some consistency, instead of it being a show about Ward, May, and Coulson with some other people cracking jokes in the background. It's likely hard to realistically portray reactions to Ward's reveal; when Ward shot Agent Victoria Hand in episode 17, "Turn, Turn, Turn," my reaction was "Holy crap," but the same would sound silly coming from Coulson. The writers strike just the right balance here in keeping most the team subdued except actor Iain De Caestecker's Fitz, who both refuses to believe Ward's betrayal and then starts throwing things; what could have been melodramatic was instead spot-on. The writers go subtler in "Nothing Personal" with Fitz's mooning over Simmons; as opposed to his overt whining about why Simmons won't give him the time of day in episode 18, "The Only Light in the Darkness," here the writers let De Caestecker portray his feelings with looks and movement, not monologue; this character, too, ultimately gets to display a larger range with Ward's departure. Ultimately, then, "Nothing Personal"'s final scene of the new team sitting poolside at a cheap motel is telling. They are not "gearing up" or "planning strategy," as Ward and May were wont to do on the team's high-tech jet; instead, they're joking around, commiserating, and eating junk food by the pool, even Coulson (May, appropriately, still lurks in the shadows). It's here we get that glimpse of what the show is about; not the expertly-maneuvered spy games that we might have expected from an Agents of SHIELD show, but rather a show about a group of weird heroes banded together against the world. That's an OK premise, and likely quite watchable, though it's dizzying the time it took to get to this point. SHIELD still has some details to shake out. They can't possibly find reasons for Ward to reappear each episode, so either his storyline has to come to a conclusive end or he has to be relegated to recurring guest star status, like Nicholas Lea's Krycek on X-Files, plus whether the team will have a base and whether Triplett will stick around or be replaced with someone else. But, "Nothing Personal" suggests a show finally finding its footing, if hopefully not too late for its own good. The first half of AoS suffered (IMO) because they had to wait for Captain America 2 to come out and move the plot forward. I'm with you in that the show has finally come into its own. When you think about it, this is a pretty incredible experiment on Marvel/Disney/ABC's part. This is a weekly television show with major plot developments connected to a major motion picture... and the episode with those developments aired the very week after said movie premiered. The only thing that comes close to it is Star Trek, but the Borg plots on Voyager happened years after First Contact and weren't all that great as the series went on. If DC has a chance to compete with the Marvel Cinematic Universe, they'll have to get their TV shows synched up to each other and the films very quickly. Also, over the summer once the AoS and Winter Soldiers DVDs are out, I'll likely review Nick Fury Vs. SHIELD, one of the major influences on both of them (and, coincidentally, the book that launched Bob Harras to fame). I think your theory about the first half suffering because it was waiting for Captain America 2 is probably right; clearly, given Mike Peterson et all, the showrunners knew where they were going with the show and what "beats" they had to hit when, vis a vis the movies. On one hand, I do absolutely agree with you that this is pretty incredible to have a televised and movie universe linked up like this. And you know me, I'm a sucker for crossovers and continuity, so the show and the movies working hand-in-hand certainly delights. I thought it was especially interesting when the show kind-of, sort-of seemed in "Nothing Personal" that Agents of SHIELD was moving the "whole story" forward a bit outside the movies (Hill now working for the military, etc.). The danger, and what I think hurt the early part of this season, is that the show risks being just an offshoot of the movies and not its own entity such that nothing really major can happen on the show without an accompanying movie (SHIELD couldn't fall without Captain America 2, for instance). This could create a sense that everything will always be OK in the show and that all the toys will go back in their box at the end, lessening the show's suspense. I'd like to see something like Tony Stark finding out that Coulson is alive on the TV show, and then later referenced in the movies, just to reinforce that the show does have some impact. On the other hand, as I referenced above, it was a terrible risk to delay the "meat" of the show until Captain America 2 came out, and one that I think backfired. Obviously the showrunners thought they had a strong enough show to function up until the big reveal, but I don't think the ratings bear that out. Hopefully, if SHIELD gets a second season, the strength of the end of this season will carry over into the whole of the next. Would be tough for DC to do the same, no? Surely Gotham can't exist in the Batman vs. Superman universe, or at least it would be so far removed as not to be relevant, I don't think. Conceivably Arrow could be the same universe, but I doubt they're putting Grant Gustin in the movie, so two different Flashes might be tough to explain, too. I think DC will probably have to content itself with a connected televised universe only (Arrow and Flash), though I'd hardly say no to an ARGUS TV show starring Steve Trevor branching off the Justice League movie. While the series hasn't been officially renewed, I wonder if that's because they'll change the name due to SHIELD no longer existing and "reboot" it as a new show. It's such a Marvel move too; if this happens, I really hope the first episode of the new series is titled "All-New Number One" or something like that. Would be interesting but IMHO a name change would be too confusing for the "average" consumer to work out well for the show. I would hope a "reboot" wouldn't jettison the cast for new characters; I might've hoped that in the beginning, but now I think it would be equally too tough to warm up to new characters after spending a season warming up to these. Also they should get Iain De Caestecker to play Jimmy Olsen in a movie. Accent notwithstanding. Just saying.